Vinyl fencing is a terrific solution for many Baltimore area fencing projects. It’s environmentally safe and durable. Vinyl fencing is also maintenance-free and has excellent weather resistant properties. Vinyl fencing won’t chip, fade, rot, rust or peel and it never needs staining. It also has a smooth surface and is safe for children and pets. Vinyl fencing can outlast a wooden fence, further adding to its value. Rustic Fence offers a wide selection of quality vinyl and options to meet your particular design and construction needs. Rustic Fence, Inc.’s weather-resistant vinyl is manufactured from premium quality PVC (polyvinyl chloride), which provides exceptional impact strength and UV resistance. Vinyl fencing has Colorlast fade protection, so it never needs staining or painting, steel reinforced bottom rails, and no visible fasteners. Vinyl fencing is an exceptional value, saving you money on replacement and maintenance costs. 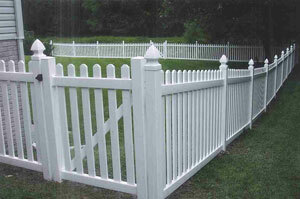 We carry all kinds of vinyl fence solutions and can special order any product to fit a special need. All the vinyl fence products we carry are of premium quality, and we offer vinyl fence products from many of the top vinyl fence manufacturers. We’ve been building wood fences since 1975 in the local area and built our customer base through hard work and determination, and our team is known for their professionalism and courteous approach to every job they perform. 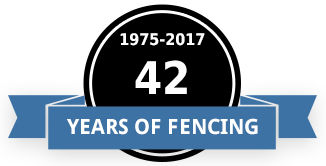 For over 40 years, we’ve provided residential and commercial fence and installation services throughout the area, including Ellicott City, Clarksville, Olney, Frederick, Mount Airy and much more. Our reputation for service and workmanship is unparalleled in the business and we offer a great selection of fencing materials for your every need. Please be sure to visit examples of our work throughout this website. We have experienced installation crews with extensive knowledge of the diverse needs of our clients. Whether you’re looking for a baseball field, sport court, fencing for your business or home, fencing for your farm animals and more, call us today.